These are the pepper spray laws we are aware of. However, we do not guarantee that they are up to date. Ultimately, it’s your responsibility to ascertain the legality of pepper spray in your area. • New York Pepper Spray Laws: New York residents may only purchase defense sprays from licensed Firearms Dealers or licensed Pharmacists in that state. *You may however, buy animal repellents such as Mace Muzzle Dog Repeller, Mace Bear Spray, and Guard Alaska Bear Spray, which work just as well as standard pepper spray. • Massachusetts Pepper Spray Laws: Massachusetts residents may only purchase defense sprays from licensed Firearms Dealers in that state. 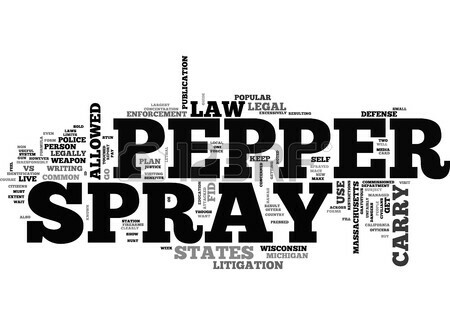 • MichiganPepper Spray Laws: OC Pepper spray can be no stronger then a 2% concentrate (Different companies can sell different concentrations.) CS is the only Tear Gas accepted and can be no larger then 35 grams per can. No combination spray allowed. *You may also buy animal repellents such as Mace Muzzle Dog Repeller, Mace Bear Spray, and Guard Alaska Bear Spray, which work just as well as standard pepper spray. • Wisconsin Pepper Spray Laws: Tear gas is not permissible. By regulation, OC products with a maximum OC concentration of 10% and weight range of oleoresin of capsicum and inert ingredients of 15-60 grams are authorized. This is 1/2 oz. and 2 oz. sprays. Further, the product cannot be camouflaged and must have a safety feature designed to prevent accidental discharge. The units may not have an effective range of over 20 feet and must have an effective range of six feet. In addition, there are certain labeling and packaging requirements: must state cannot sell to anyone under 18 and the phone number of the manufacturer has to be on the label. The units must also be sold in sealed tamper-proof packages. *You may however buy animal repellents such as Mace Muzzle Dog Repeller, Mace Bear Spray, and Guard Alaska Bear Spray, which work just as well as standard pepper spray. • California Pepper Spray Laws: Requires that the maximum canister size be 2.5 ounces (70 grams) in weight. NOTE: Pepper Spray is legal in all 50 states, however a number of cities and states have pepper spray laws & restrictions on sizes, strengths, and the way your purchase them, etc.. If you have a question about pepper spray laws in your jurisdiction, it is wise to check with your local city or state attorneys office. Pepper sprays should only be purchased by those 18 years of age or older. The above list may not be totally accurate or complete and Supreme Defense accepts no responsibility for its accuracy or completeness.